In masonry construction, repointing is a process of renewing the 'pointing' which is the external part of mortar joints. Over a period of time, weathering and decay can cause voids in the joints between masonry, usually in bricks, allowing water to penetrate through the void. Water entering these voids can cause severe damage. Types of brickwork pointing are very important, not only does it make your brickwork look good, but it adds resistance to weather, which will aid the brickworks longevity. It is important that the new pointing is very neat and consistent, something Ace Wall Ties has been experienced in for many years producing exellent results throughout Sussex. There are 2 main types of pointing, although others styles are availble and may be recommened as more suitable, depending on the age and type of property. Concave or Bucket Handle Pointing. Concave pointing or more commonly known as “”bucket handle” is probably the most commonly style of pointing and is created with a Jointing Iron. 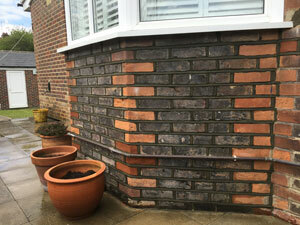 The mortar is pushed edge of the brick with the jointer to create a curved affect, allowing the water to run off the joint and achieve good resistance to rain. Weather Struck jointing is a less common technique, mainly due to the fact that it is time consuming to achieve and requires a lot of experience so can be more costly. Ace Wall Ties is very experienced takes pride in this style of pointing. 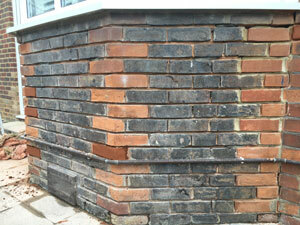 When done correctly it will give a lovely finish and again achieve good resistance to adverse weather. The new mortar should be designed to match the mortar type, color and texture of the existing mortar to avoid incompatible materials and visual aberrations. The repointing process begins with a mortar analysis where a sample is taken and examined to identify the components, ratio, and aggregate. The old mortar is removed to a depth equal to or slightly more than the width of the joint, or to the point where sound mortar is reached. Removal of old mortar is usually removed with a diamond tipped motar raking disc to a depth of between 15-20mm taking care not to damage the masonry units. Vertical joints are done by hand or with small power chisels. Dust extraction equipment minimizes the inconvenience to the customer and neighbours. The walls are then washed down thoroughly to remove all dust from the bed joints in preparation for the new pointing. The mortor is applyed by hand using a traditional hawk and trowl, insuring there are no voids, and the mortor is then shaped to the required finish. Although the majority of our work is for the private domestic properties, we regularly undertake contracts for local authorities and councils, and are capable of larger contracts as required. Flintwork Pointing is also available on request. Here at Ace Wall Ties, and as members of the Wall Tie Installers Federation you can be confident of only the highest standard of workmanship. There are only a few local members so ensure you use a WTIF member. It will not cost you any more and you will have the option of an Insurance backed Underwritten Guarantee. 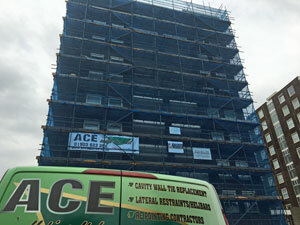 Ace Wall Ties Limited have been actively involved in Cavity Wall Tie Replacement and Re-pointing brickwork since 1987. 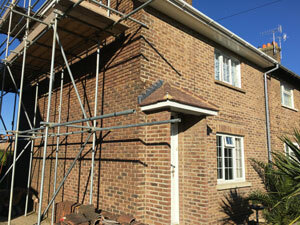 We are also fully equipped to REMOVE Cavity Insulation.